Look what I found on my screen this morning! How beautiful life is! It looks like a type of moth but I’m not familiar with all the different species of moths. Either way it was a treat to see! Hello everyone! I’m so glad to see you! I’m Jana, I’m an eccentric wife and mother; I work 2 jobs and homeschool my kids. With all this going on in my life, I want to focus my attention on the things that make me happy, and the one thing that has made me happy ever since I was a little kid is nature. As my life progressed and changed through my teen years and my early married life, I lost my connection to it. Life took over and here I am living disconnected from nature because of work, bills, and every day events that keep me away. So the next chapter of my life will be dedicated, at least in some small part, to reconnecting to nature; I still have a mortgage, work, and a family to take care of, but now, I will be more aware of nature and my place within it. Each day, I will find some small way to not harm nature. Not long ago I was introduced to something called permaculture and I fell in love with it. Basically, it’s building a small ecosystem in your own backyard that is based off of what nature would do naturally. In turn your backyard helps you, and you help your backyard…with minimal work!! At first it may take more work, but over time, your backyard will become self-sustaining and you won’t have to work as hard…other than harvesting. I love the life lessons that I learn from nature, so what I promise to do is share a lesson that I’ve learned from nature each week, share what I’m learning about permaculture, and share my own personal progress in changing my homestead into a permaculture Garden of Eden. And since it’s hard to make any changes in life, I want to have some free giveaways once in awhile…all nature themed of course, to help all of us remember our ‘green’ family. Read a few articles, see if you like what is there, if you do, go ahead and subscribe. If you don’t like what you see, that’s ok, I’m honored that you took the time to get to know me a little and see my vision for my blog and my life. This entry was posted in A Look Outside My Window and tagged a look outside my window, beauty of life, moths. Bookmark the permalink. Beautiful! 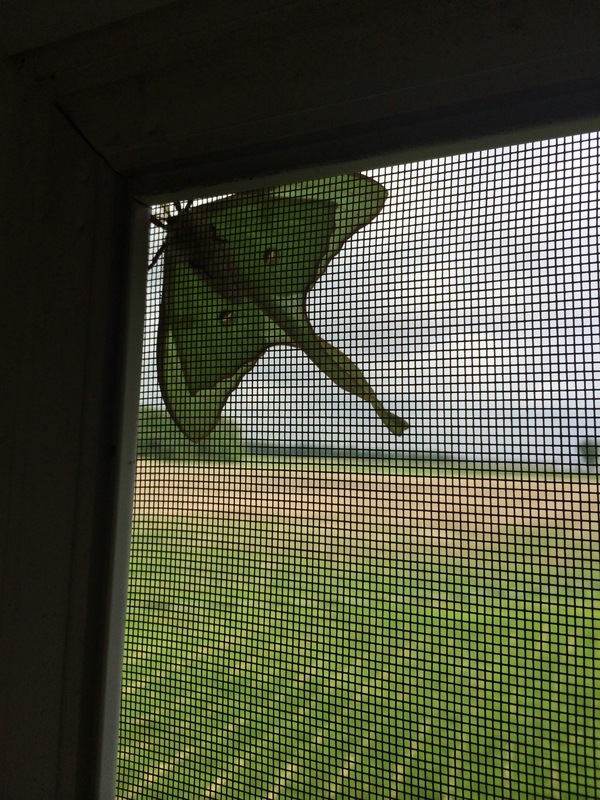 I think that’s a Luna moth.